Here’s a couple of photographs of my Bulldog Fatigue Meter. 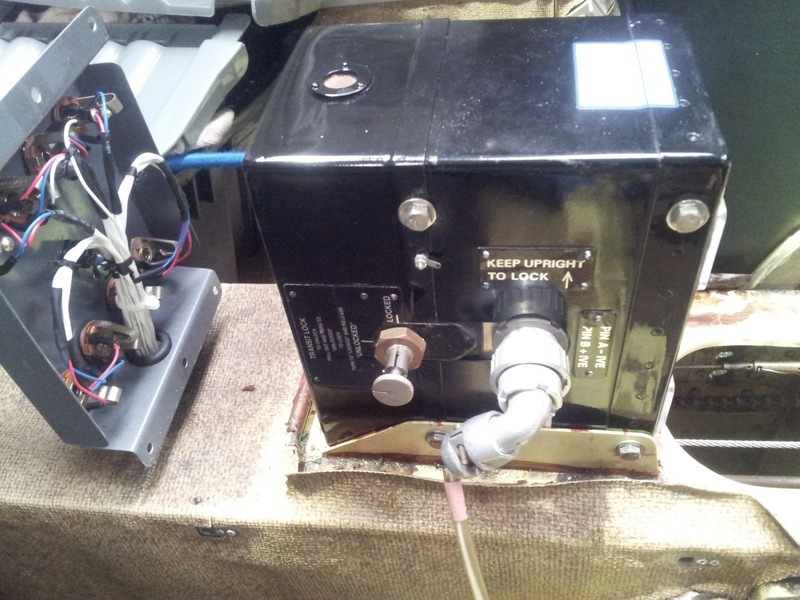 The first is front-on, showing the “g” (pronounced “gee”) readouts, spanning a range of “bins” (or “buckets”) from -1.5 g to +6.0 g. The device is about half the size of a shoe-box, and was built by Negretti & Zambra (Aviation) Ltd (in the 1960's, as far as I can determine). The readouts are all zero since they were reset during the overhaul. The second image shows the instrument mounted on its bracket located between the aircraft front seats (the “glovebox”/pedestal assembly which normally covers the device has been removed for access). ...is not actually a "Fatigue Meter"
Now, calling it a “Fatigue Meter” is a bit of a misnomer since it doesn’t actually measure “fatigue”. It measures “airframe-vertical” acceleration i.e., in the direction “through the seat” (as opposed to “airframe-horizontal” acceleration “along the nose”). More specifically, it counts the number of times the (“airframe-vertical”) acceleration (at the location on the airframe where the instrument is mounted) exceeds various threshold values, defined by the respective “bin” readings. The key point is that in order for the airframe to achieve a given (“airframe-vertical”) acceleration, the wings must have provided the required force, and moreover, this force must have been transferred through the mechanical structure which connects the wings to the fuselage. This mechanical connection between the wing and the fuselage is the most (structurally) critical area of an (non-rotary) aircraft, and is typically the strongest part of the entire structure. If you pull truly excessive “g”, you can exceed the mechanical strength of the structure, and the (proverbial) “wings will fall off” (just as you can bend any piece of metal to its breaking point by applying sufficient force). That is kind of obvious. But a more interesting and subtle failure mode is that of “metal fatigue ” where the application of many repetitive cycles of loading can cause cracks to form in regions of high stress concentration, ultimately leading to sudden and catastrophic failure. Moreover, each loading cycle can be well within the limits of the structural strength, yet the cumulative effect over many cycles can lead to failure (the reason is due to the physics of crack formation associated with the microscopic material behaviour common to all metals under stress). I can't mention aircraft metal fatigue without a nod to the most notorious example of metal fatigue in aviation history: the infamous De Havilland Comet where repeated loading of the fuselage structure due to (routine) cabin pressurisation/de-pressurisation cycles led to crack formation in the corners of the square windows (the square corners – a serious design flaw -- concentrated the stress, leading to the catastrophic failure after less than 400 cycles (i.e., 400 flights). A tragically expensive lesson: rectified by simply using rounded windows, as on all airliners since!). Bulldog Airframe "Fatigue Index (FI)"
...But back to the Bulldog, where the most important structural element is the attachment between each wing and the fuselage. During the original certification of the aircraft, an assessment was made by the manufacturer (based on cyclical load tests on a ground test rig) of the maximum allowable number of load cycles across the range of load values (larger loads will lead to fatigue failure sooner than smaller loads). Specifically, in the case of the Bulldog, the failure (on the test rig) corresponded to crack formation in the vicinity of the outer bolt hole in the metal straps connecting the main wing spar to the fuselage structure (the wings did not “fall off” the test rig, but the initiation of cracking in that specific sensitive location was considered critical as it could eventually lead to catastrophic failure). It is a convenient mathematical consequence of the physical nature of metal fatigue, that this can all be expressed in terms of a single (non-dimensional) number, known as the “Fatigue Index” (or “FI”). When the “FI” reaches the maximum allowable value (the “Fatigue Life”), the aircraft must be grounded until the structure can be modified (strengthened) in accordance with an (approved) design, such that the life is thereby extended. In the case of the Bulldog, the “Fatigue Life” happens to correspond to an “FI” of 114. Once reached, the aircraft requires a strengthening (the “Bulldog spar mod”) of the attachment between the wing spar and the fuselage, and the life can be extended to an FI of 200. Specifically, this “mod” involves replacing the existing metal straps (which connect the wings to the fuselage) with larger ones (which consequently requires the drilling of new bolt holes through the main spar – so it is not a trivial undertaking). 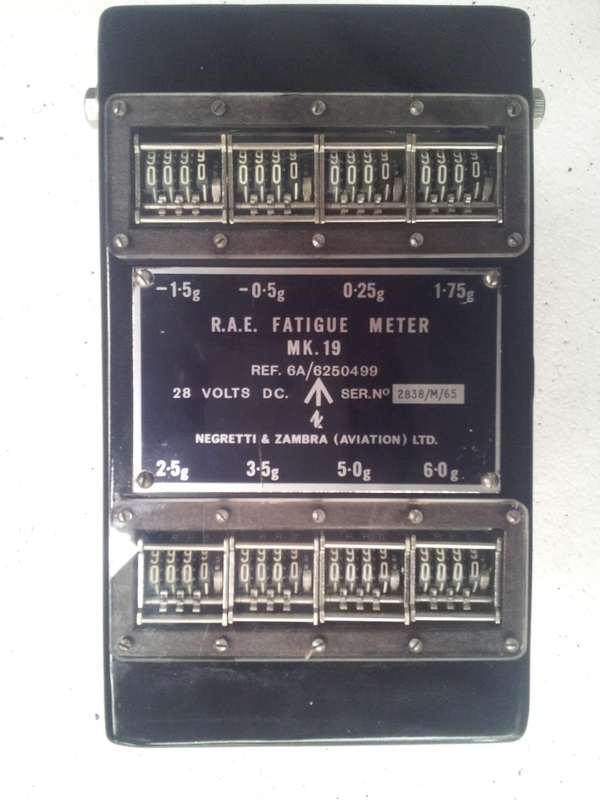 How does the Fatigue Meter work ? To re-cap, the Fatigue Meter counts acceleration cycles across multiple distinct bands (“bins”) which are then used to assess the FI and remaining life. It may surprise you to discover that fundamentally, the internals of the Fatigue Meter comprise a “distance sensor” (i.e., rather than a direct measurement of acceleration), as described in the caption to the schematic above. 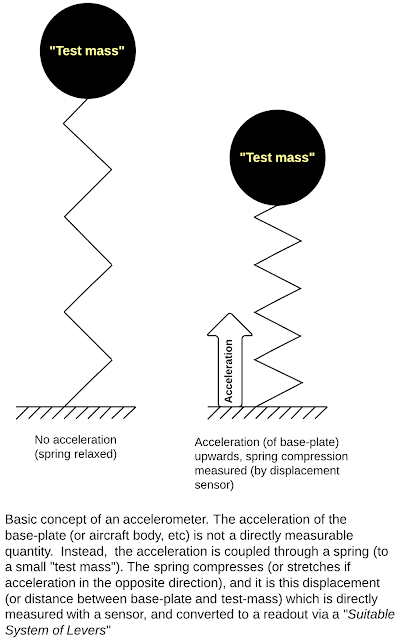 As the airframe accelerates, the acceleration is transmitted to the “test-mass” via a spring – the compression (or extension) of which is measurable by a sensor. Then, a Suitable System of Levers (“SSL”), converts this sensor output to the numerical counters, displayed in the readout panel. I first came across the “SSL” in the Royal Air Force (University Air Squadron) ground-school, whereby the “SSL” was invoked to explain away the complexities of any aircraft system considered too complex for (mere) trainee pilots (or dare I say, flying instructors) to understand. All we needed to know about were the fundamental physical principles (e.g., Bernoulli’s law for pitot tubes etc), and the “SSL” would take care of all the details. To re-cap, we’ve got as far as understanding that a glorified mass-on-a-spring gives us a measure of acceleration, which (via an "SSL") can be used to assess the airframe fatigue life. All quite simple, in principle. We now get to the last – and perhaps most interesting – part of this story. Recall what happens when you push the nose forward just the right amount (or relax the back-pressure at the top of a loop, just enough) to establish “zero g”. It’s a distinctly odd sensation even for those fleeting moments (and I can’t imagine what it must be like for astronauts subjected to sustained zero-g for weeks, months or years!). But here’s the thing: we call it “zero g” (or “free-fall” or “weightlessness”), and indeed our mass-on-a-spring would read “zero” i.e., the spring would be in its relaxed state, neither compressed nor extended. But is the acceleration zero ? Just ask Felix Baumgartner – or any skydiver for that matter! Of course the acceleration’s not zero! They are accelerating (rapidly) towards the earth: in fact, at precisely “one g” – certainly not “zero g”. If they weren’t, they wouldn’t need a parachute! So how can we be accelerating at “one g” when our accelerometer (Fatigue Meter) at the same time reads “zero g” (and we feel as if we are floating, “weightless”)? This “Equivalence Principle” is mystifying. So mystifying, that physicists are still trying to verify if it is ultimately and exactly true, or only approximately true (and breaks down if you look closely enough). The answer matters: if it turns out to be false, then Einstein’s theories are approximate, not fundamentally true descriptions of nature. This is important -- and many scientists actually hope this to be the case -- because General Relativity does not fit neatly (in a mathematical sense) with the rest of physics (Quantum mechanics): something must give, and most physicists expect that General Relativity is the one that will have to give. Then again, General Relativity is a towering intellectual achievement that has survived all experimental tests to date. For example, Einstein's theories predict that space and time are all affected by gravity. Not least, your GPS receiver, which relies on Earth-oribiting atomic clocks and radio waves, is influenced by gravity and motion in ways unimagined by Isaac Newton (who three hundred years earlier discovered the pre-Einsteinian approximate mechanical laws describing the dynamics of bodies in the Universe). If we ignored relativistic effects, and didn't compensate for the Einsteinian corrections in the GPS system, the navigational errors would be significant, on the order of 10 kilometres per day ! In a previous career, I worked with a team of engineers and scientists at Stanford University, NASA and ESA (European Space Agency) to devise ever more accurate (space-based) experimental tests of General Relativity. Such experiments are extremely difficult (and expensive). As such, the jury is still out. The next time you push the nose forward, relax at the top of a loop, or merely jot down the readings from your humble Fatigue Meter, take a moment to acknowledge that by doing so you are in a sense probing one of the deepest, as-yet-unexplained mysteries of the Universe. ...all that from a glorified set of bathroom scales (plus an SSL, of course)! You will notice that your iNavCalc PLOG emails now include a link to "view the route in GoogleMaps and share with anyone via browser, email, and Twitter". This very simple but powerful feature enables you to view your route from any mobile or desktop browser. Moreover, by sharing the link with anyone (whether a registered FlyLogical user or not), they may also view your route. Additionally, the viewer provides options for tweeting and emailing the route to your friends and followers. The email option automatically attaches the route exported in ".gpx" and ".fpl" file formats, providing extreme portability across people, applications, and devices. As well as via the embedded links in the PLOG email explained above, you can open the viewer directly from the iNavCalc web-app route editor by clicking the (new) share buutton, as highlighted (yellow circle) in the screenshot below. Last but not least, you can use the viewer to share routes created via any other software or device which supports the ".gpx" or".fpl" formats (i.e., not just those generated by iNavCalc). Simply send the given ".gpx" and ".fpl" file as an email attachment to plogs@flylogical.com . A few moments later you will receive an email with the route URL, which you can then share with anybody, as described above. You do not need to be a registered FlyLogical user to a access these features. They are open to everyone.